Following up on my previous post about converting videos to Ogg Theora, there’s also an easy way for those who like a GUI. 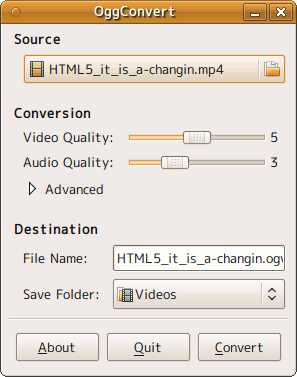 Although it’s possible to use VLC for Ogg encoding, I had problems with the audio and video being out of sync. Fortunately I found another way – enter OggConvert. By default, the target file is saved in the same directory and with the same name as the source file but with an .ogg or .ogv extension. The default quality settings seem a bit low but should be adequate for most purposes. This entry was posted in Other and tagged howto, HTML5, Linux, video on 19 February, 2010 by Daniel. Ogg Theora is the codec most supported by modern HTML5-capable browsers, so how can you convert your videos to it? Pretty easily, it seems. If the audio is out of sync with the video, either try adding the –sync option or convert it to MPEG format using ffmpeg first, and then use ffmpeg2theora. ffmpeg2theora input.mpeg --title "My spiffing video" --artist "Daniel" --license "http://creativecommons.org/licenses/by-nc-sa/3.0" --date "2010" --organization "Opera Software" --location "Tokyo, Japan"
N.B. For Mac, there’s Exom which has ‘HTML5′ as one of its output options (thanks Bruce). UPDATE: If you’d prefer to not use the command line, there’s a GUI alternative for easy Ogg conversion. 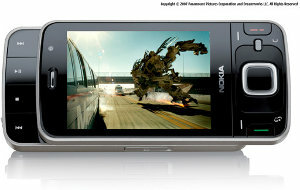 This entry was posted in Other and tagged howto, HTML5, Linux, video on 5 February, 2010 by Daniel. Continuing with the Wii theme, I found out how to convert videos so they can be viewed on the Nintendo Wii. Flash videos viewed online in the Opera browser. 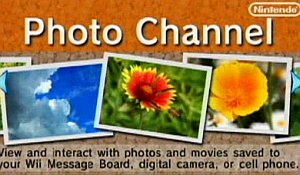 AVI files viewed from a memory card in the photo channel. I looked into the AVI method as I have a 2GB SD card handy. It seems the Wii only supports MJPEG video files which, while compatible with many digital cameras, tend to be very large with a 100MB file giving you just a few minutes of video. You need to have Mencoder installed first (it’s part of MPlayer) and you may need to change the framerate (fps) to 23.97 or similar if the audio is out of sync. Mencoder should accept any video format as input (i.e. FLV, etc. ), not just AVI. This entry was posted in Other and tagged video, wii on 17 March, 2009 by Daniel.